Yesterday Poker Hall of Famer Henry Orenstein reached the final table of the Event #61: $10,000 Seven-Card Stud Championship, ultimately finishing in eighth place after being eliminated in a hand against another member of the Poker Hall of Fame, Phil Hellmuth. Hellmuth would go on to finish sixth in the event, while Matt Grapenthien would eventually take the title after besting Todd Brunson heads-up. While we all know Hellmuth’s large collection of WSOP bracelets helped earn his spot in the Poker Hall of Fame, Orenstein’s accomplishments and contributions to poker may not be as familiar to most. Besides winning a bracelet in 1996 in a seven-card stud event, Orenstein patented the hole card camera which proved such an important contribution to the rise in popularity of televised poker. Orenstein has lived an exceedingly fascinating life as a Holocaust survivor who immigrated to the United States from his native Poland, going on to become a toymaker and inventor with more than 100 patents to his name. He also had a primary role in the development of the Transformers series of toys which have remained popular for decades and have spawned several blockbuster films. Meanwhile after his bustout yesterday Orenstein also took some time to visit for a while with David Tuchman during the WSOP.com live streaming presentation of the Event #61 final table. 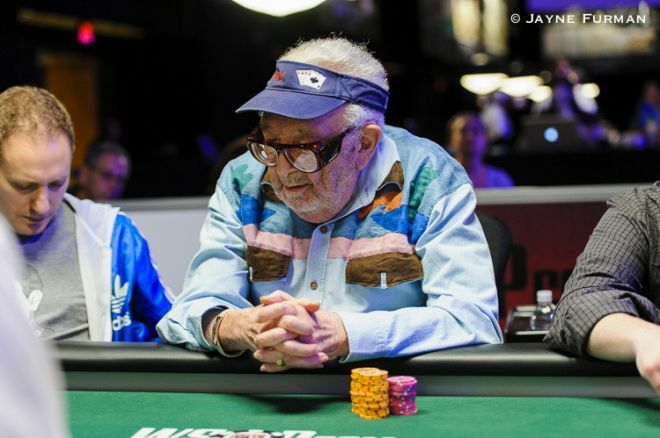 Their conversation was absorbing to listen to, and included more than a few insightful observations from Orenstein about the game of poker as he has viewed it over a long lifetime of playing the game. Here Orenstein sounds a theme I personally find especially interesting, namely, the unique way poker reflects American ideals and its culture — an appropriate topic to consider on this Fourth of July. I’ve mentioned here before that I teach a college course called Poker in American Film and Culture in which we not only talk about those westerns to which Orenstein refers, but also that deep connection between poker and America. Thus did his comments about playing poker as a youth resonate with me in a couple of ways. From there he related the amazing story of his escape from Nazi concentration camps and a few details of his work in the toy industry, then talked more poker including offering advice about the importance of bankroll management. “The brain is probably a muscle like everything else,” he said. “If you don’t exercise your arms, you don’t have strong muscles. And I think the same thing holds true for the brain. If you sit there and do nothing with the brain — just watch things (or are) inactive — I think it causes atrophy and eventually the functions diminish. So if you keep active — and playing poker keeps you active all the time (thinking about) ‘what are the odds?’ or ‘what does the guy have?’ — I think that’s the best exercise that you can have, playing poker. The WSOP is archiving all of its live streams, so you can visit their videos page where eventually they’ll be posting the stream from the Event #61 final table, if you’re curious to hear more from Orenstein’s visit which as mentioned came shortly after his elimination. The videos are great as well for learning strategy by following final table play and listening to the commentary by Tuchman and his many guests. In any event, as Orenstein well attests, poker can be a great game for both young and old.